A soluble recombinant form of CD147, CD147Rg, which consists of the cDNA coding for the entire extracellular region of CD147 fused to the DNA coding for the hinge region, CH2 and CH3 domain of human IgG1. 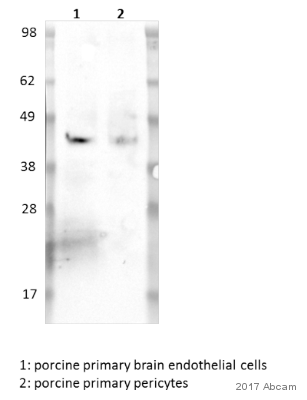 This antibody recognises extracellular Ig domain D1 of CD147 antigen. This antibody gave a positive result in IHC in the following FFPE tissue: Human Testis. Our Abpromise guarantee covers the use of ab21903 in the following tested applications. Flow Cyt Use a concentration of 4 µg/ml. Plays pivotal roles in spermatogenesis, embryo implantation, neural network formation and tumor progression. Stimulates adjacent fibroblasts to produce matrix metalloproteinases (MMPS). May target monocarboxylate transporters SLC16A1, SLC16A3 and SLC16A8 to plasma membranes of retinal pigment epithelium and neural retina. Seems to be a receptor for oligomannosidic glycans. In vitro, promotes outgrowth of astrocytic processes. Present only in vascular endothelium in non-neoplastic regions of the brain, whereas it is present in tumor cells but not in proliferating blood vessels in malignant gliomas. Cell membrane. Melanosome. Colocalizes with SLC16A1 and SLC16A8 (By similarity). Identified by mass spectrometry in melanosome fractions from stage I to stage IV. IHC image of CD147 staining in Human Testis formalin fixed paraffin embedded tissue section, performed on a Leica Bond™ system using the standard protocol F. The section was pre-treated using heat mediated antigen retrieval with sodium citrate buffer (pH6, epitope retrieval solution 1) for 20 mins. The section was then incubated with ab21903, 0.1 µg/ml, for 15 mins at room temperature and detected using an HRP conjugated compact polymer system. DAB was used as the chromogen. The section was then counterstained with haematoxylin and mounted with DPX. ab21903 has not yet been referenced specifically in any publications. Publishing research using ab21903? Please let us know so that we can cite the reference in this datasheet.